1st Thursday, May 2, 5-8 pm. 965-6611, from 11 am – 5 pm Mon.-Sat. 1-5 Sun. Original paintings, Greeting cards, Jewelry and originals in a bin. Artist Reception: Friday, July 5, 5-8 pm. Refreshments served. You are cordially invited to watch Suemae give live painting demonstrations on July 13 from 11-5 PM! Presented works include Koi fish, flowers & birds, and landscapes. Suemae Lin Willhite draws inspiration from the beauty of nature and her spiritual journey. Inspired by the poetry of influential Tang Dynasty poet Han-Shan, this work depicts Suemae’s impression of the poet and his hermit lifestyle. Zen themes from his poetry are a source of tranquility and inspiration. 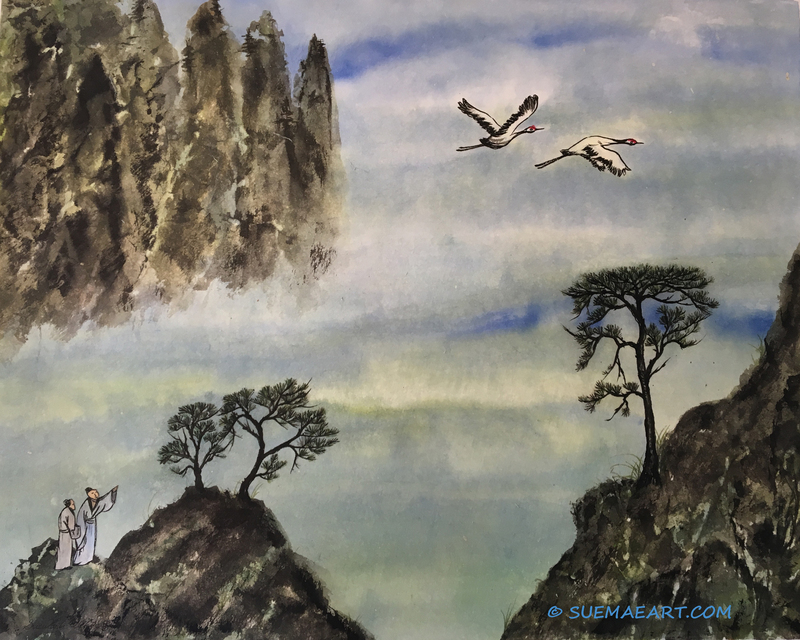 For more information please visit SuemaeArt.com where you can sign up for online classes or find information about Chinese Brush Painting workshops at SBCC/SEL.